Alternatively, we can cling to a state of denial, and the dominant system will be replaced by arrangements that are not necessarily positive. The reality that cannot be spoken is that all the financial systems we believe are permanent are actually on borrowed time. One way we can judge this decline of resilience is to look at how long it takes systems to recover when they are stressed, and to what degree they bounce back to previous levels. 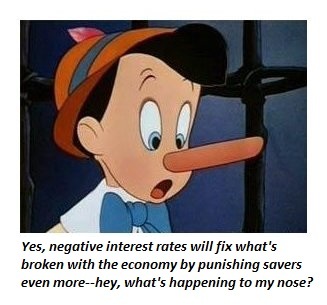 Another is to look at the extremes the system reaches without returning to "normal": for example, interest rates, which rather than normalizing after seven years of suppression are being pushed to negative rates by increasingly desperate central bankers. The key insight here is that financial systems and indeed economies function as natural systems. Central planning/central banker manipulation appears to control the system, but this control masks the reality that the system is increasingly fragile and prone to collapse, not just from internal dynamics but as a direct result of central bank manipulation. The warning signs of fraying resilience are all around us. Nature's Warning Signal: Complex systems like ecological food webs, the brain, and the climate all give off a characteristic signal when disaster is around the corner. "The signal, a phenomenon called 'critical slowing down,' is a lengthening of the time that a system takes to recover from small disturbances, such as a disease that reduces the minnow population, in the vicinity of a critical transition. It occurs because a system’s internal stabilizing forces—whatever they might be—become weaker near the point at which they suddenly propel the system toward a different state." Recent email exchanges with correspondent Bart D. (Australia) clued me into the Darwinian structure of this critical slowing down and loss of snapback (what we might call a loss of reslience). The dominant systems do not operate in a vacuum; beneath the surface dominance of one system are many other systems that are suppressed by the dominant system. As the dominant system weakens/slows down, these largely invisible systems quickly expand to occupy more of the ecosystem. An example in the financial realm is barter: in a system dominated by central bank/state issued money and digital transactions, barter still exists but on a very modest scale. When central bank/state currency loses its value and utility (due to devaluation of the currency, hyper-inflation, etc. ), then barter expands rapidly to fill the vacuum left by the demise of the dominant system. The ecosystem example illustrates is how critical transitions occur: as the dominant system slows down, other systems fill the ecosystem niches that are opened up by the weakness of the dominant arrangement. At some point, the equilibrium of the ecosystem is disrupted and a new balance of other dynamics become dominant. In the realm of currencies, the rise of crypto-currencies is an example of a nascent new system gaining ground as the dominant system slows/decays. In financial systems, this process can be at least partially conscious: we can see the dominant paradigm weakening, and start developing other systems that can compete for the coming openings in the financial/social ecosystem. Alternatively, we can cling to a state of denial, and the dominant system will be replaced by arrangements that are not necessarily positive. Conscious development of alternatives that can compete transparently for dominance as the status quo decays is the most effective avenue to more resilient, sustainable systems. This essay was drawn from Musings Report 2016-3. The Musings Reports are emailed weekly exclusively to subscribers and major contributors ($5/month or $50/year).